I completely understand these frustrations, however, all of these are easily overcome. “CRM is too much for my business. All I need is email marketing.” That may be true now, but then how are you going to collect all the data you need to develop your marketing and sales strategies to attract more qualified leads? You can’t without CRM. CRM enables you to collect data about your customer to ENHANCE your email marketing. “I do not have the money for a CRM platform” Investing in your business is the only way that you can GROW your business. 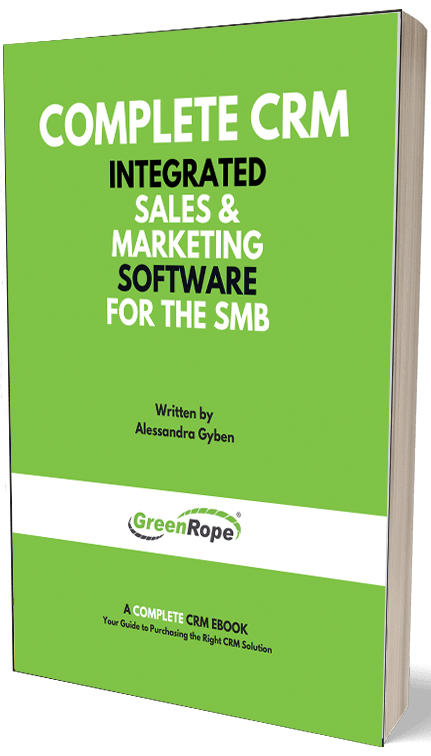 GreenRope, for example, is a very cost-effective platform, that comes stacked full of tools you need. If you don’t spend today, you won’t be making much tomorrow. “CRM is too complicated and will take too long to learn” We are the first to say that CRM implementation doesn’t just happen overnight, however that is why companies have training and onboarding processes to help you get up and running quickly. However, you must commit to training and be proactive. Just like anything in life, practice makes perfect. If you are a business owner, these three goals reign supreme. What business doesn’t want to accomplish all three? Well, that is where CRM can help you out. CRM increases efficiency by allowing you to view all engagements, emails, phone calls, website visits, clicks, etc from one place. Why does this increase productivity? Because you don’t have to go search for all of this data, it is right there in front of you. You also do not have to remember what was said during each call or when you said you would call them back. CRM is your second sales brain. CRM helps you close more deals because you are able to stay on track with your leads. With scheduled follow ups, detailed notes, and more data than accessible than ever before, it is easier to develop a relationship with contacts. The more consistent touches you have assists in closing more deals. CRM helps your business provide a better customer experience because you know more about your leads and customers and can therefore provide a more personalized experience. We all want to be catered to, and this is how businesses do it, by getting to know their customers. The more you know, the more equipped you are to develop more customized experiences for each and every one of your leads and customers. So, you see, CRM is an investment, and one that needs to be made yesterday. The benefits of CRM far outweigh any negativity you may have had before you read this article. Search for CRM systems that fit YOUR business and empower YOUR team. In order to save time, you’ve got to first put in the time.